I’ve always been an environmentally minded person. When my father cut down the acre of forest in our backyard, I felt so bad for the trees that I vowed not to speak with him again (I caved sometime after dinner, several hours close enough to eternity for a 10 year old). I stopped eating meat years ago, have always been suspicious of where recycling really goes, and have an uneasy relationship with shopping for anything, especially if it comes in a package. Since starting my plastic project, I’ve been systematically cutting down on the plastic in my life. I’ve substituted metal and glass for plastic containers, cotton and wool for polyester and nylon, cellulose for synthetic sponges. At any give time, I likely have a reusable bag, bottle and pair of chopsticks within reach. So when I asked my students to write down all the plastic objects they touched in 24 hours, I decided to check in on my own plastic habits and do the assignment along with them. The results? My life, as the 67 item-long list documents, is far from plastic free. Some of the items represent things I can’t easily control: the synthetic carpet in grad housing; a strong glasses prescription. But many more are things I am not willing to go without, plastic objects part of important daily practices I feel I could not otherwise perform. Most concerning are the 17 things that could be considered single-use, containers not meant to be refilled, razor blades that cannot be sharpened, food packages that will long outlive their contents. I do not often possess the skills that alternatives would require (I am mortally terrified of wielding a straight razor), competency lost as disposables and ready-mades proliferated long before I was born. In other cases it’s a matter of time. While I enjoy making and baking all kinds of things from scratch, I would have to seriously re-arrange my life in order to supply myself with homemade staples like laundry-soap and almond milk on a regular basis. Trained to think about systems, not individuals, I try not to beat myself up or judge others too harshly for plastic habits. After all, plastic is part of the ways we have learned to be capable participants in everyday life. I do not like alienating people or myself (always in danger of being labeled an eco-freak). But understanding these complicated commitments is only part of the process. There is a fine line between not blaming and not doing anything at all. Every time I tell a group of students about my research, someone sheepishly hides a single-use plastic bottle under the table. But we don’t need to feel bad about plastic, we need to put the bottle back on the table, think about how it is connected to the politics of a shared way of life and capitalist mode of production, and look for the cracks through which it can be changed. 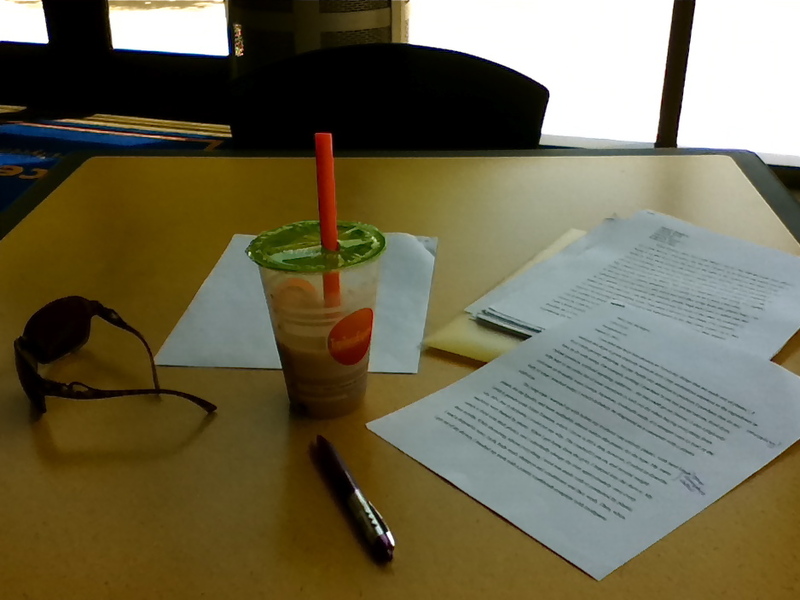 As I grade my students’ reflections on their plastic days, can’t help but notice that I am still surrounded, sitting in a plastic chair at a plastic table, with a plastic cup and straw (oh boba, how I can’t leave you), beside my plastic sunglasses, grading with a purple plastic pen. It seems I have done more to change my ability to see plastic (in pretty much everything) than to give it up. I don’t have an easy solution for my plastic life, but there’s one thing I do know: an individual giving up the bags, bottles and cutlery symbolic of plastic habits might be a place to start, but it is far different from systemic change. How much plastic is in your life? Very thoughtful. I love animals and stopped eating meat 6 years ago. I also stopped buying leather products. But your post makes me realise that I should look closer at what I am consuming every day. It is an interesting post. I am not really an environmentalist but I do have a strong hobby in reading. I have ever thought of replacing plastic bags with paper bags; unfortunately, I find out that producing paper bags require more energy, which will contribute to global warming. So, I guess reusable plastic bags will be the best alternative, as of today. I also think that it is important for you to differentiate between plastics with long-term and short-term cycles. For example, your plastic chair will be a long-term one, because I do think you will keep your plastic chair longer than plastic bags you get from a supermarket. My life is probably more plastic than I know. Even parts of our home is constructed with some plastic….which by the way, I don’t totally disagree: otherwise we have to cut down more trees or use more metal. Engineered building plastics sometimes last longer than wood, etc. for building structural components. I think this dialogue needs to pull in professionals from the engineering world also. Burning plastics in a fire of moveable objects is highly toxic and it’s been shown statistically (ie. National Fire Prevention Association would have some data), that majority of people don’t die from being burned alive, but from inhalation of smoke and burning toxic gases when they are trapped inside a burning building. Example: burning sofa or an upholstered furniture. If we could find a solution with the new glut of plastics: computer equipment at our landfill sites!! There’s only so much can be done to repurpose an old computer, cellphone, printer, etc. So would be great to get your students to think about the plastic waste as a result of technology equipment. I really loved reading this article. It really tells us a lot about our consumption habits. Just like you, I too try and avoid using plastic but I feel overwhelmed by the amount of plastic that surrounds us esp. packaged food. I then feel totally helpless yet I feel that consciously not consuming certain things made of plastic will go a long way in reducing plastic usage. Daunting, isn’t it? I like your point about looking at systems rather than individuals. Individuals have to take the actions, but it inevitably either changes the system or goes up against it. Nice post, congratulations on being Freshly Pressed. What a scary list! I hate to think how much longer mine would be. It’s the food packaging that really bugs me – even though we hardly buy any supermarket meat or fruit/veg, we still throw away a bag full of plastic wrappers each week. You say a lot of wise things here, though, especially about the systemic view. Thanks! Thoughtful post, yet reasonable. Focusing on what we can do is a great life skill no matter the topic! Good post, made me think about my own consumption and laziness when it comes to the environment. When I was a kid, we were thought to think about the environment at all times, however over the years it seem that the thoughtfulness has diminished. I think that the worst habit that I have started with is throwing recycling cans in the bin, knowing that someone will rummage through it find the can and bring it to the store for the refund (it’s really horrible I know!). For a couple of weeks now, I have been trying to find a new project to immerse myself in, and now I have found it, so thanks for the inspiration! Awareness is half the battle in our society. Nice post! Definitely, but it’s the other half of the battle that I’m less sure how to deal with…. Even in Canada and the US, many of the things we ‘recycle’ end up in landfills or are shipped to Asia for reprocessing. Those little triangles aren’t promises that facilities or markets exist. That said, I can’t stand the thought of throwing a plastic bottle in the trash rather than the recycling…. Working on the eco footprint of mine, need much improvement on the handy plastic habbit I must confess. Thanks for the seed planting in my consciousness… hmmmm…. I make myself pick up litter to remind myself to be more aware. It works. Plastic on the roads in the woods has really cut me back on my buying stuff I don’t need. Thanks for your input. It’s nice to hear here are a lot of people working for our environment. I was having this discussion with someone the other day! It’s unbelievable how plastic we have in our lives now. You can’t go to the grocery store and buy one thing that isn’t packaged in plastic and sometimes they even have in wrapped double. I joked about getting funny looks from the checkout reps who have to price my veggies that I don’t put into bags! What a waste!!! I know! even many of the local farmers’ markets sell things already in plastic bags. On a related theme, a few years ago I read about a New Zealand couple who had committed to making no more than, I can’t remember the exact details, but let’s say one trash can worth of waste in an entire year. Can you imagine how exhausting that would be. It’s a fascinating challenge to think about.The more ‘advanced’ our community is, the harder it would be. Unless we start re-organizing our communities – setting up stores that sell more things in bulk, making ‘refillable’ the new normal. They maybe it wouldn’t seem like more work than figuring out how to open all those tricky disposable packages (seriously – what to do when the scissors packaging requires scissors to open?). How much plastic is in your life? None! Cast iron, stainless steel and glass is all I have used since the seventies, and have had to replace only those items that have been stolen from me. I still use my Vita Mix too, it’s only forty years old. Any tips for avoiding plastic? It’s the packaging that I have the most trouble with. I always make sure my dad remembers our reusable bags when we go grocery shopping. the stores always put about 2-3 items in one of their plastic bags. This is inspiring! The city where I live in has a local law that will ban the sale of plastic as primary and secondary packaging materials (this will take effect next week). I should also do something like this- list down all the plastic that I’ve touched/used in a day and see how I can cut it down. Thank you for this post! Wow, where do you live? Would love to see how that works out in actual practice. I know that when they banned plastic bags in San Francisco, many businesses simply took to giving away much thicker bags not included in the legal definition of disposable. Enlightening! I enjoyed reading this. Check out my blog sometime! Reblogged this on Urap Kangkung. I don’t think I could even COUNT the plastic I use everyday. What’s even scarier would be to try to calculate how much of the plastic I use is internalized in some way, within me. I would love to cut down on my plastics, but it’s hard since it’s one of the most used and durable materials out there. At least blogs like this alert you to pay attention to things you would ignore otherwise 🙂 Thanks…Great blog! Yikes! It’s hard to imagine life without plastic these days. It’s shocking how pervasive it is really. I guess we can just keep trying to reduce our consumption however we can. Thanks for the post. My life is too full of plastic. Thanks for the enlightening post! This is a GREAT post. My piano teacher’s daughter is actually the founder of “5 Gyres”, (I see you referenced) so I get great insight from her also. Thanks! YES! Anna and her husband Marcus. Kim De Wolff Create a free website or blog at WordPress.com.